From inception to the top of the charts it took over a full year and two record labels, neither of which Ivory Joe Hunter was even recording for at the time, for this make its slow climb and ultimately reach the mountaintop. Welcome to the world of independent record companies of the 1940’s. To get there though first we have to backtrack a little. The number of artists running their own successful labels is a fairly short one, especially early on. In the mid-to-late 1940’s Hunter was among the first who did so (Roy Milton, not a rocker but close, did briefly as well) and it wouldn’t be until Johnny Otis nearly ten years later that another fairly notable artist-owned label was launched. 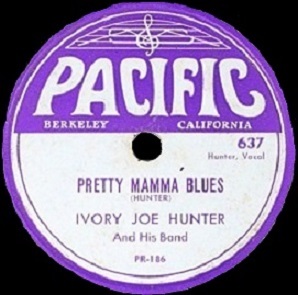 Hunter’s first venture in this realm was dubbed, not surprisingly, Ivory Records and soon after he started his second label which he called Pacific Records. As most who tried found out it wasn’t the easiest of tasks to be both a label owner and an artist at the same time. While it’s one thing to MAKE records it’s another thing entirely to press, distribute, promote and collect the money for records sold. That’s a full time job unto itself and Hunter quickly learned he was unable to pursue both a career as an artist and a record label owner, so when King Records came calling inquiring about his availability (or he went to King offering his recording services, and really it makes little difference to this aspect of the story), he gave up Pacific Records and would go on at King to establish himself as a commercial powerhouse in his own right. But what ultimately pushed him into that really popular stratosphere as an artist was ironically one of the records he cut for Pacific, Pretty Mamma Blues (or Pretty Mama Blues as it’s more commonly spelled these days). But beyond merely the alternate spelling of the record’s title wreaking havoc with search engines here’s where it gets really confusing. When Hunter signed with King in the fall of 1947 he had an already recorded backlog of Pacific masters yet to be released. These were songs Hunter wrote, arranged and probably in some cases had tested out in clubs to determine which were worth putting to wax in an effort to get a hit for himself on his own label. In other words, a lot of work had gone into them and while Hunter was one of the most prolific songwriters in rock history he probably wasn’t so cavalier about that ability to consider simply discarding ones already recorded, let alone 32 of them! So Hunter set out to get something for his troubles. Whether or not he offered them to King chieftain Syd Nathan, a notoriously cheap figure even amongst other notoriously cheap figures that made up the independent record companies of the day, isn’t certain. Maybe he did and Nathan said he didn’t want them, but that seems unlikely. For one thing he was signing Hunter based on his ability to cut good original material so it stands to reason that Nathan would at least want to HEAR what was already recorded and see if something jumped out at him as a potential hit. After all that’d save the time and expense of recording him themselves to start with and they’d be able to put something out immediately while Hunter prepared new material while they scheduled their first sessions on him. If the offer was made maybe the fact that Nathan wouldn’t own the publishing on them had something to do with the decision as well, but that’s all speculation at this point. Regardless of what really happened behind the scenes of their contractual negotiations the gist of it is the Pacific recordings Hunter had already made would NOT be accompanying him to King Records. Perhaps Hunter – knowing how companies always chiseled their artists – thought he could one-up them all and sell the Pacific masters, lock, stock and barrel, to another label hoping to pick up a hit or two without the fuss of actually arranging sessions, paying sidemen and a producer and mastering the results themselves. Whatever the true circumstances he cut a deal with 4 Star Records, another relatively small independent label that previously specialized in country music as well as some Latin sides, to take control of all the masters from Pacific. 4 Star was owned by Bill McCall, a particularly loathsome snake in a business that has more forked tongues than you can shake a stick at. Nobody but his own mother (presumably) ever had a nice thing to say about McCall over his long career as he was busy ripping off every artist under the sun, with country legend Patsy Cline being most famously incensed by his thievery down the road. But Hunter seems to have got the better of him, such as it were, by simply selling him the masters outright (let’s hope it was for cash), already having copyrighted them to better ensure royalty payments (McCall was notorious for claiming writing credit, as so many label owners were, to boost their income and rob their artists further), and he left McCall to do what he wanted with them once the deal was transacted. Then, maybe without so much as mentioning it to Nathan, Hunter got down to business recording new songs for King Records. If that’s the case, good for him, it’s nice to see an artist as the sharpest cat in the room for once. King wasted no time in getting Hunter in the studio while 4 Star sorted through what they’d acquired and in the spring of 1948 put out Pretty Mama Blues in direct competition to Hunter’s more recent – and somewhat underwhelming – work with their rival label. Imagine the surprise of all involved when it was the nearly year old Pretty Mama Blues that started catching on a few months later, in June, eventually topping the charts in the fall. So that’s the twisted, tangled back story, but how about the record itself? In many ways this rather languid ballad seemed to lay down the basic template that Hunter would follow the bulk of his career. A fine pianist and an engaging vocalist with a warm tone and clear crisp delivery, Hunter specialized in self-penned songs in a somewhat mild laid-back approach, his lyrics almost always well-conceived and filled with vivid imagery, generally of a more cerebral nature. Though the term wouldn’t catch on fully until the early 70’s maybe it’s time we simply acknowledge that Hunter actually invented the style of rock which would come to be known as singer/songwriter. Essentially he was James Taylor before Taylor was, even his vocal tone was vaguely similar. But Hunter was far more prolific than Taylor, or for that matter virtually any of the future stars of the 70’s singer/songwriter “movement”, penning and publishing over 6,000 songs in his lifetime. Of them, Pretty Mama Blues is pretty emblematic of his strengths and thus serves as a good introduction to him for the uninitiated. Befitting someone who viewed himself as a songwriter first and foremost, Hunter comes across here as an exquisite craftsman, as his delivery is done with the intent to serve up the story in just the right way. His keening vocals never strain to hit their mark yet convey all of the emotion necessary to put the story across. His piano playing isn’t showy but during the break he leaves no doubts that he’s fully mastered the instrument. The arrangement has vestiges of yesterday, particularly the emphasis on Ernie Royal’s trumpet as opposed to the rather muted tenor saxophones (remember too, this was cut the previous summer, before rock had even escaped the womb commercially), but Hunter manages to somehow create an emotional urgency simply by using his own voice, masterfully holding certain notes, sliding up the scale without drawing undue attention to himself in the process, yet the result turns the heat up on the performance all the same. “Classy” would be the adjective of choice here, both for the song and the artist himself. While very well done all around it’s not a record that jumps out at you in any way and I’m sure many with an aversion to lighter ballads in rock, or without much exposure to its earliest era and its instrumentation and arrangements especially, will find it melodically soothing perhaps but otherwise rather underwhelming. I can’t necessarily dispute that and don’t really want to for that matter. It IS somewhat restrained, no question about it. But it’s not quite refined and therein lies the difference when comparing it to the dominant pre-rock style of balladry. That earlier pop-based style which continued to sell very well long into the rock era was excessively mannered by design, the emotion seemed detached and artificial and the musical window dressing was always polite and dainty. Hunter by contrast pushes the boundaries ever so noticeably, injecting a measure of genuine longing, ache and desire into his performance that marked this as unique for the time, helping to signify what the difference was between rock and everything else. Viewed nearly seventy years later when much of that period seems hopelessly straitlaced in comparison to what followed the difference may seem negligible – maybe not much more than loosening one’s tie in public rather than wearing it snug under a starched collar – but at the time it was a definite step towards something different, more relaxed and carefree yet more urgent and alive at the same time. Call it real fruit as opposed to waxed fruit maybe, but keep in mind that you can’t live off the latter, while with the former, while it may not be what you want to eat three meals a day, you can at least take as big a bite as you want and it will nourish you until the main course is served. Besides, it got Hunter on the menu and soon he’d be offering up feasts. 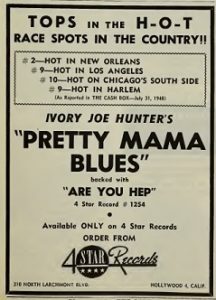 Leave a reply on "Ivory Joe Hunter: “Pretty Mama Blues”"